And then it hit me–as though God himself was shining a bright light upon the bookshelf–the angels sang and my hand was drawn to the book like a moth to a flame. “Charlie the Ranch Dog,” stared back at me with puppy dog eyes saying, “Pick me, pick me!” I couldn’t resist. Are you singing, “How much is that doggie in the window,” too? 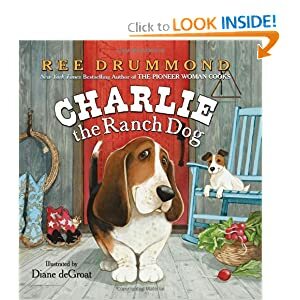 Oh, if only Charlie the ranch dawg was real. I bought the book. I found the other one I wanted,too, “Beautiful Girl.” And another I purchased for the sake of Arbor Day (which was that day, in fact)–“Celebritree” about famous trees. I checked my watch again–whew! If I drive like a crazy-lady and run all of the red lights, I’ll get to preschool on time. “Charlie the Ranch Dog” is too adorable for words. If you aren’t familiar with the author, let me introduce you. Ree Drummond is also known as “Pioneer Woman.” Story has it, she used to work in a city wearing all of the traditional city attire–complete with high heels. She gave up that life to marry her “Marlboro Man” and live on a ranch in Oklahoma. She began gardening and cooking from scratch (and writing a cookbook), homeschooling her four children and chasing after a Bassett Hound named Charlie. Perhaps, “chasing” is the wrong adjective. Charlie doesn’t do much, but he sure is cute. Adorbable, precious, and just what I needed that day. Funny…didn’t I just blog about Bassett Hounds starring in children’s books last week??! Oh, they are really on my mind. An independent, family-owned bookstore with locations in Naperville, Downers Grove, and Elmhurst. Features recommendations and a readers’ discount club.